Padmashri Paint Brushes come with different type of handles, both high quality wood and PVC. They are chosen to match the type of brush application and differ by regional preference and painting technique. If a brush is intended for trim painting where accurate positioning and control of the brush is essential, a slender many-sided handle may be selected for easy control. Large wall brushes may use a heavier beavertail handle for comfort and for minimizing fatigue due to the heavier brush head. Rattail or pencil style handles are used on brushes with narrow or round/oval ferrules or brushes that can be rotated as they are used. Padmashri Paint Brushes have unique acupuncture style PVC handle that reduces painter's hand pain. Our brushes are also made from Treated Rubber Wood handles and available in International Standard sizes. Most brushes will come in contact with water during painting or cleaning, The ferrule material should be resistant to rust. 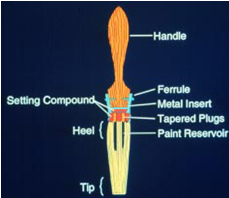 Rust from the ferrule or nails in a used brush will Bleed into the paint and cause discolored streaks. Padmashri Paint brushes are made from high quality stainless steel, powder coated , tin or pvc materials. Play the important roles of positioning and holding the filaments tightly in the ferrule and creating a paint reservoir in the middle of the brush to replenish the brush tip during painting. 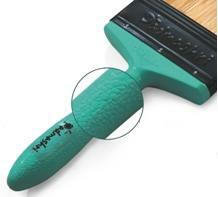 This open space helps the brush hold extra paint. Padmashri Paint brushes uses high quality machine cut wooden spacers and perfectly moulded PVC spacers.